I remember when I was pregnant with Eva, and deliberating over which car seat to buy, the advice from a friend was, “Always buy the best you can afford!”, and that advice really stuck with me. Although you may go on to regret buying a designer pushchair when a cheaper model would have done the same job, or splashing out on an expensive cot when they barely spent a night in their own room, you will never regret buying the best car seat possible to keep your baby safe. 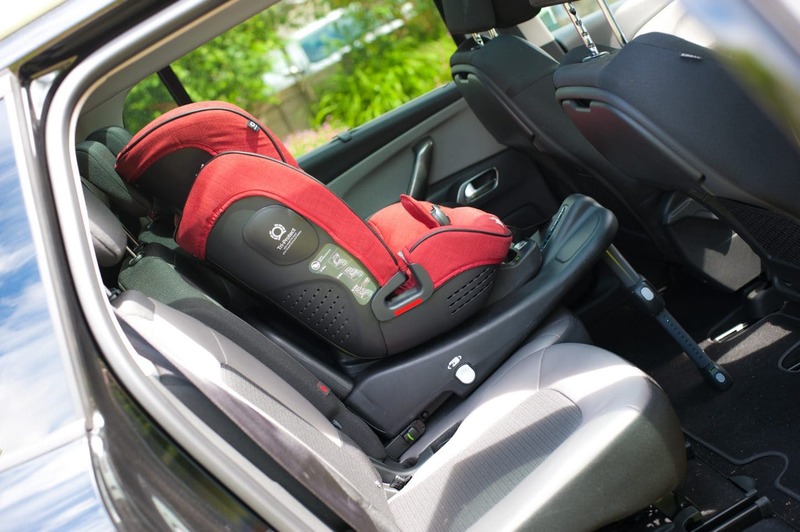 Unfortunately car seats don’t come cheap, not if you are buying from a reputable brand and particularly if you are using an ISOFIX base for extra security. I think we bought four car seats in as many years for Eva, each one very expensive but totally necessary for the stage that she was at. 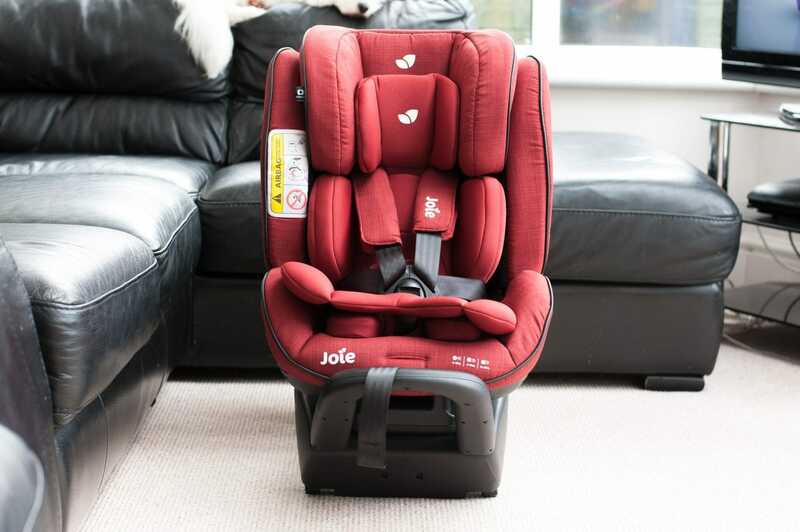 I dread to think about how much we spent over the years and so you can imagine how pleased I was to discover that Joie have brought out a car seat that is suitable from birth to 7 years!! At three, Harry has fast outgrown his car seat and having heard such positive reviews about Joie, this car seat was at the top of our list. The stages™ ISOFIX is marketed as “A travel champion born to grow from birth to 7 years.” Designed to grow from birth to seven years, Joie’s newest addition can remain reward facing until 18kg, and is capable of converting to a forward facing seat and then a high backed booster from 9-25kg. It even switches from rearward to forward facing with a quick button push. 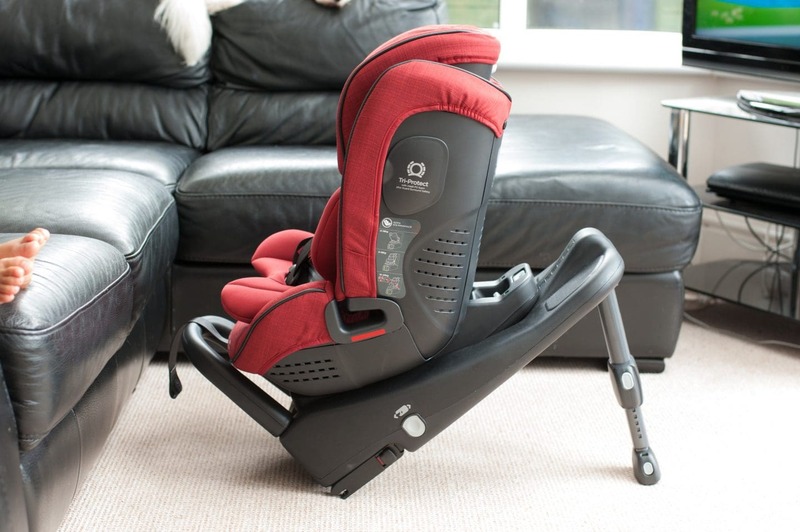 The car seat comes in a choice of two colours – pavement and cranberry. We love the deep red which adds a pop of colour to our otherwise grey interior, and Harry was pleased as red is his favourite colour! 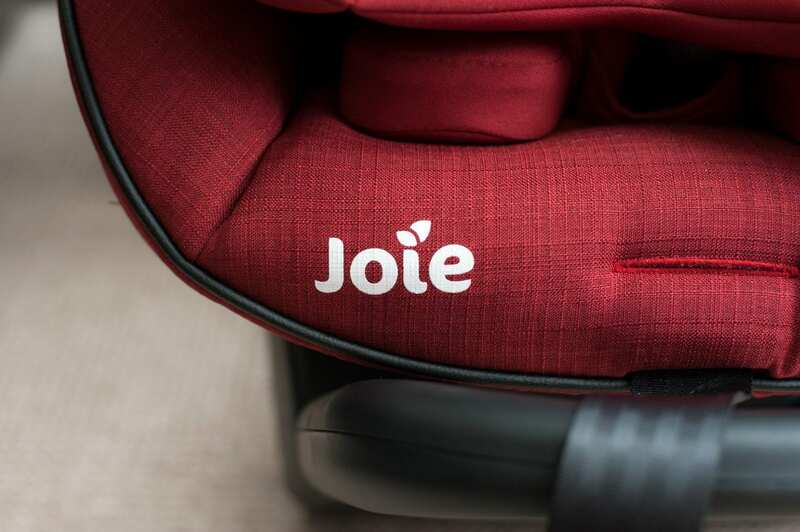 As you would expect from Joie, the car seat not only excels itself with an array of impressive safety features, but the quality is top class. The seat cover is lovely and soft whilst still being thick enough to be hard wearing. 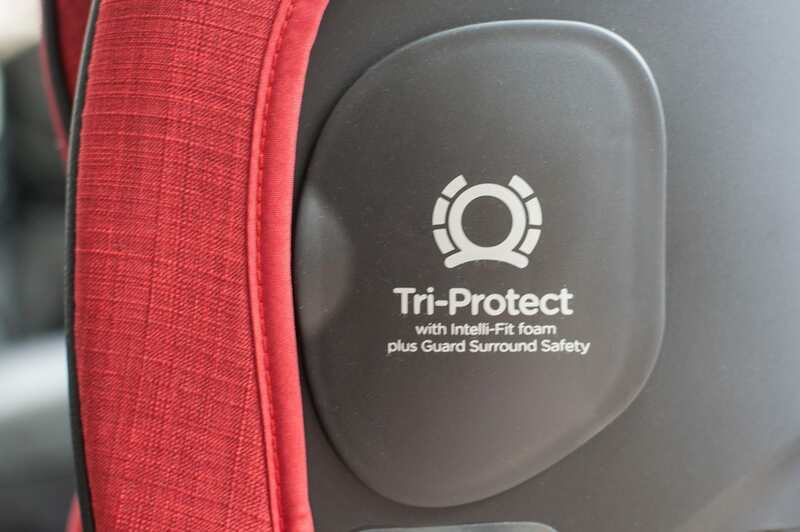 The Intelli-Fit™ foam ensures that the seat is comfortable and supportive, and the Guard Surround Safety™ panels keep your child as safe as possible whilst driving. I love that this seat comes complete with the ISOFIX base, many car seats require you to buy this separately which comes at an added cost. With a retractable ten position base, the ISOFIX can be adjusted to fit your car perfectly, and comes with colour coded indicators to confirm correct installation. We no longer require a rear facing car seat from birth and yet it was very easy to remove the full infant insert and head support to transform the seat ready for the next stage. Installation was very straightforward due to the thorough instructions in the accompanying manual as well as easy to read diagrams. Once the guide clips had been put in place the ISOFIX base slots straight in and the car seat on top of that. With a seven position recline it was simply a case of adjusting it to the perfect position for Harry which took just a few minutes in total from start to finish. Harry couldn’t wait to try out his new car seat and was very excited to hop in! I love that the 5 point harness is padded for extra comfort and also really easy to fasten. With a one pull motion to tighten the straps Harry was safely strapped in with minimum fuss and told us, “Mine love it!!”. He was clearly so comfortable that just a mile or so down the road we discovered that he was fast asleep. I love that due to the headrest his head was kept perfectly still with no risk of him flopping forward or cricking his neck to the side. Given that the only time he sleeps these days is during car journeys, this was really important to us! 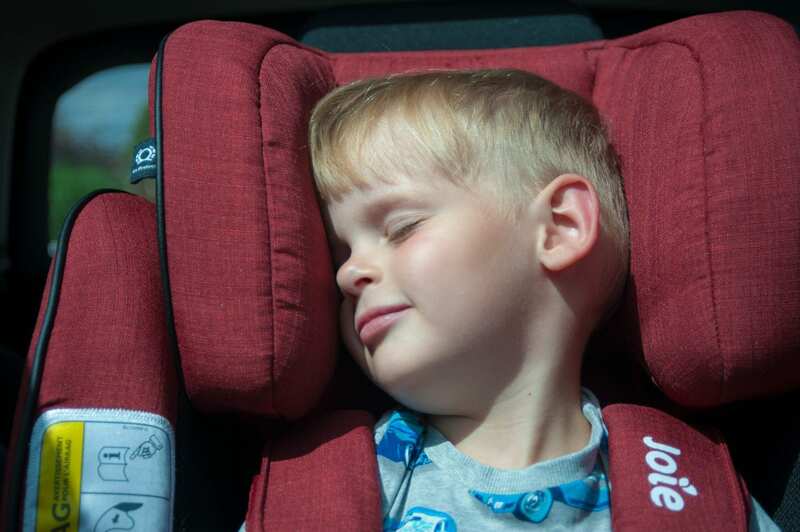 We are so impressed with the stages™ ISOFIX seat and would recommend it to anyone. To know that we will get another four years out of the car seat is so reassuring and had we bought it from birth we would have been able to get the full seven years. Having seen just how sturdy and secure the seat is when used together with the ISOFIX it has pushed us into getting the same for the girls. For £300 I think that this is amazing value considering what we have previously spent on different stage car seats. Look so comfortable baby seat . Unfortunately we don’t have children yet . But in my country not so much peoples having their baby seat for their baby . Perhaps its costly . This car seat looks amazing and I so wish I had gotten one of these. I think they are pretty new though and don’t really remember seeing them when my youngest needed his first car seat. I have a friend who has one and she says its amazing and so worth the money. Wow birth to seven years that really is a hard working product I wish we had this from the start what a fantastic product! Very comfortable baby seat!! And great tips! Having twins it has always been a big subject ? We have a Joie I-anchor advance car seat for our two year old daughter and love it! In fact we were involved in a serious car crash last year and it quite literally saved her life! That’s great that it comes with the base! I’m looking for a car seat for my parent’s car as our next stage car seat won’t work in their car without its own base. Will add this one to my list as it looks comfy and a good investment as my little one isn’t even 1 yet. What a great post! Many people don’t know how important baby car seat is…and how important it is to choose a good one. looks amazing and i love the advice! I think there are some things in life you don’t scrimp on, a car seat is one of them! After all if you were to get in an accident and something terrible were to happen you would always be saying what if!! What a lovely looking car seat. I like the colour and design. That looks so comfortable! They should make them in adult sizes!! In all seriousness though I think its amazing that you can use it from birth until 7 years old! I feel like you can’t get that many years out of most baby products. That car seat looks awesome and safe! Your little one looks so comfortable and so cute! thank you for sharing this, I need to upgrade my daughter’s car seat soon. 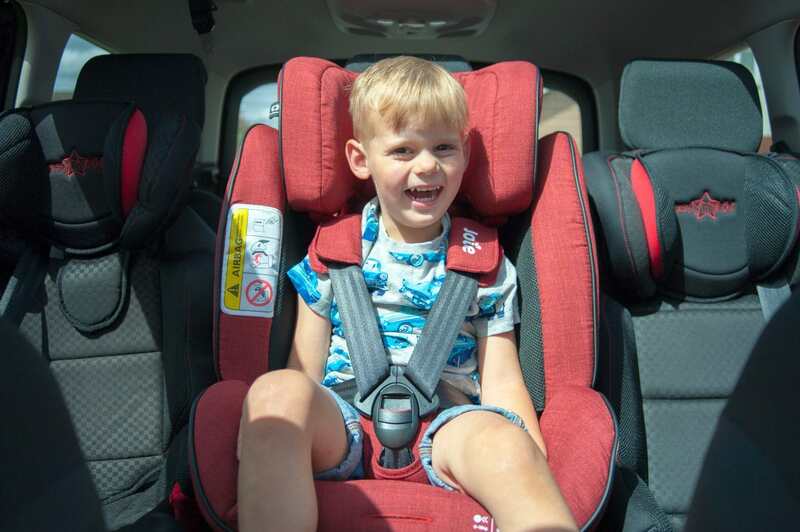 The safest seat in the car for a child is the middle seat of the rear seats and that’s where you should put the child seat and rear facing baby seats are the safest and you should keep your child rear facing up to around 15 months or a long as possible. My smallest is still in his baby seat. We need to upgrade soon, this looks great! Looks comfy! Great that you have found something that suited him so well in terms of sixe and colour! Child safety in the car is of paramount importance as is choosing the right car seat. This one sounds like a great make. We’re currently in the process of considering getting our youngest a new car seat. This looks great. Thanks so much for linking up at #KCACOLS. Hope you come back again next time. That’s like the best chair I’ve ever seen haha! Can I bookmark this until I get married and have kids?! LOL! I’ll show this to my cousin who has a 1-year-old and may want this! That’s such a comfy car seat! 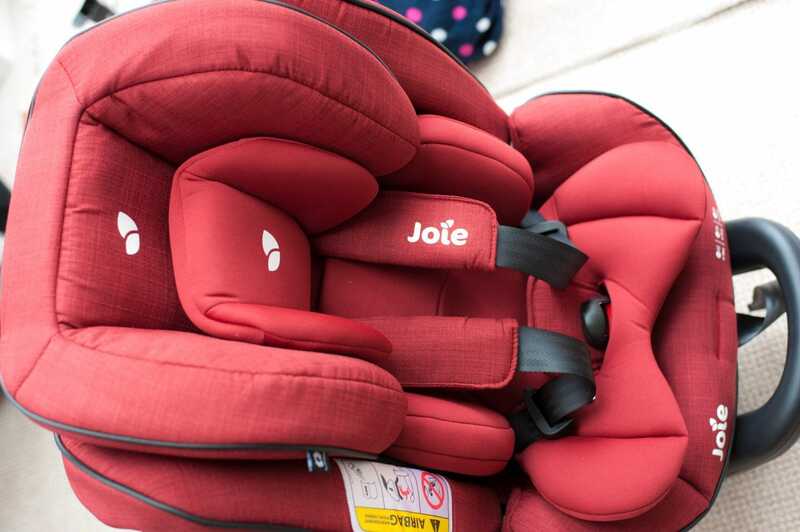 Haven’t used a product from Joie before and it is time to upgrade the car seat for the little one! May end up getting one from Joie if we could afford the price. I’ve seen this Joie brand a couple of times recently and I have to say their products look very comfortable! I like how you can use it from birth and last you up until 7! Such a wonderful car seat, I love the fact it can be used for such a long period of time! I agree with your friend, buying the best you can afford is the best way to go! Looks like a great car seat! I need this seat in my life. We have lengthy journeys in the car and it looks so comfortable! That would be great if you don’t mind. Many thanks.